MBTA Commuter Rail trains and buses take you from Boston to Salem every 20 to 30 minutes, but it's more fun to take the fast Salem Fast Ferry at least one way. Many people travel to Salem MA (map) by car, but it's easier and more fun to go by boat or train—or perhaps boat from Boston to Salem and train from Salem to Boston. MBTA Commuter Rail trains on the Rockport line run from Boston's North Station to Salem, Beverly, Gloucester, and Rockport. After Beverly, some trains go to Ipswich and Newburyport. Salem is served by MBTA Bus 450 (Haymarket Station—Salem Depot), which leaves from Boston's Government Center parking garage next to Boston's Haymarket subway station (Green Line or Orange Line). Under good traffic conditions, the bus trips take just over an hour and end at the Salem Depot (MBTA Commuter Rail station), about 10 minutes' walk from Salem Common and most Salem attractions. The fastest way from Boston to Salem is the least direct: take I-93 north to I-95 north, then MA Route 128 North, and take the exit marked for MA Route 114 and Salem (map). A more direct route, via US 1, is not usually faster. The most direct route, via MA Route 1A, is slowest because it passes through many towns (and many traffic signals) along the way. MA Route 1A North becomes Lafayette Street in Salem. Note that routes and highway signs on the North Shore can be confusing. Routes are filled with turns, and signs are inconspicuous or missing. It's great to have a GPS or smartphone map app. 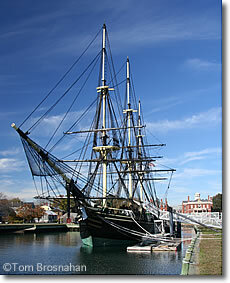 Above, too bad you can't sail to Salem on the Friendship (Salem Maritime National Historic Site).